The study of antiprotons in cosmic rays is an exciting field of research today. Cosmic ray antiprotons are believed to be produced when the high-energetic particles interact with the interstellar gas forming secondary particles. Such collisions are expected to produce a certain limited number of antiprotons, thus offering an explanation for the small fraction of antiprotons (about one per 10,000 protons) observed in cosmic rays outside of the Earth᾿s atmosphere. In addition to secondary antiprotons there are possible sources of primary antiprotons; those most often discussed are products of dark matter particle annihilation and evaporation of primordial black holes. Among the favorite dark matter candidates are the so-called WIMPs that in pairs can annihilate into known particles and antiparticles, making it possible to infer WIMPs in the Galactic halo by the products of their annihilation. Detailed measurement of antiprotons in CRs could help solving one of the biggest puzzles in modern physics, the nature of dark matter. Predicting the flux of secondary Cosmic Ray antiprotons poses two significant challenges. The first is related to uncertainties related to the cosmic-ray galactic diffusion and propagation mechanisms while the second is related to the poor knowledge of the production cross- section for antiprotons, that consequently limits theoretical calculations. In the past years, new space missions like the AMS-02 and PAMELA experiments have significantly improved the precision of the antiproton flux measurement, extending it to antiproton energies up to 500 GeV. By precisely measuring other nuclei which are believed to be secondary, in particular the Boron flux compared to the Carbon one, they could also provide a calibration for models accounting for the propagation of cosmic rays, thus addressing the first uncertainty. By precisely measuring other nuclei which are believed to be secondary, in particular the Boron flux compared to that of Carbon, they provided a calibration for models accounting for the propagation of cosmic rays. Recently, the LHCb experiment at CERN contributed to the second missing piece by presenting new direct experimental measurements of the antiprotons production cross section. 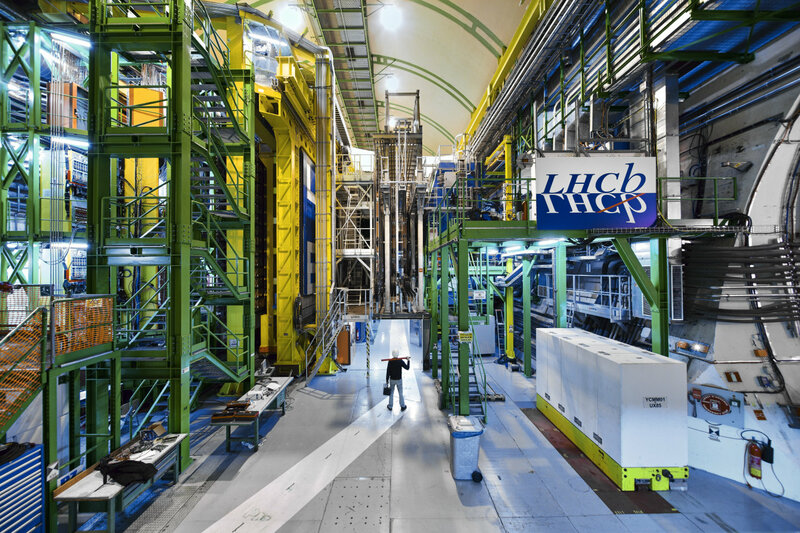 The LHCb experiment measured for the first time the antiproton production in pHe collisions, which are responsible for the production of about 40% of the secondary antiprotons, hydrogen and helium nuclei being the main components of both the primary cosmic rays and the interstellar medium. The result has been submitted to Physical Review Letters and was presented in August during TeVPA 2018. The energy scale, √ sNN = 110 GeV, and the measured range of the antiproton kinematic spectrum are crucial for interpreting the precise p cosmic ray measurements from the PAMELA and AMS-02 experiments by improving the precision of secondary antiproton cosmic ray flux prediction. The first detections of antiprotons in CRs were reported almost 35 years ago by Bogomolov et al. (1979) and Golden et al. (1979), both reporting an excess with a factor of ∼3 above expectations. The excess was later shown to be due to some poorly understood background. However, these measurements stimulated an intensive discussion about the possibility to observe primary antiprotons produced in exotic processes. The recent high-precision measurements of CRs, however, have changed the landscape dramatically. PAMELA has measured the antiproton-to-proton flux ratio from 1 to 100 GeV and more recently AMS-02 extended this measurement up to 500 GeV. Both experiments, found that there might be a slight excess of the antiproton flux above a few tens of GeV energies compared with the expected flux of secondary antiprotons, which could be explained by a Dark Matter model without constraints from other observations such as γ-rays. One of the caveats of this study remains the uncertainty on production cross- section of antiprotons. Therefore, a substantial improvement of our understanding about secondary and primary CR antiprotons calls for substantial improvement of the antiproton production cross-section. LHCb results fill in an area for which until today there had been no data. The experiment is well suited for this type of measurement thanks to its forward geometry and its System for Measuring Overlap with Gas (SMOG). Their combination endows LHCb with a fixed-target like geometry allowing to use the powerful LHC beams. Thanks to SMOG, a small amount of noble gases can be injected in the LHC beam pipe around the LHCb collision region, thus allowing to perform fixed-target collisions using the LHCb beams. Possible targets currently include He, Ne, and Ar gases, while other gas species, notably hydrogen, could be used in the future. The data for this study were collected in May 2016, from proton beams with an energy of 6.5 TeV hitting helium nuclei at rest (√ sNN = 110 GeV). Using the excellent tracking and particle identification capabilities LHCb count antiprotons in bins of momentum and transverse momentum, with momentum ranging from 12 to 110 GeV/c. The results for this study are shown in Fig. 1, and represent the production cross- section for antiprotons promptly produced in the collisions. These results should decrease the uncertainties on the computation of the antiproton flux, allowing to improve the interpretation of measurements from cosmic-ray experiments. Figure 1: Antiproton production cross-section as a function of momentum, integrated over various pTpT regions. The data points are compared with predictions from theoretical models. The uncertainties on the data points are uncorrelated only, while the shaded area indicates the correlated uncertainty. The measurement was made possible thanks to a novel method developed by LHC physicists to deal with a possible large systematic effect, stemming from the difficulty in estimating the luminosity. Since the density of the gas target is not precisely known, the luminosity was determined from the yield of events where an atomic electron from the target is scattered elastically by the proton beam into the detector acceptance. "These events are hidden within the much more abundant background from hadronic collisions with helium nuclei, but have a distinctive signature: an electron identified in the detector with the right kinematic properties, and nothing else. This allowed to select a high-purity sample of events due to proton-elastic scattering, whose cross-section is very well known, so that the density of atomic electrons could be computed", explains Giacomo Graziani from INFN, one of the key investigators in this analysis. The result is the first in a programme exploiting the fixed-target configuration of LHCb, which will provide unique measurements of interest for nuclear and cosmic rays physics at the relatively unexplored scale of √ sNN ∼ 100 GeV. These measurements could deepen our understanding of how cosmic rays interact both at the interstellar medium and in the atmosphere, thanks to the possibility of using neon gas a target, while nitrogen and oxygen could also be possible in the future. “Physics in the fixed target configuration with LHCb was not originally foreseen, and is a stunning demonstration of the vitality of our collaboration and of the great flexibility of our detector and data taking systems." comments Giovanni Passaleva, spokesperson of the LHCb collaboration. "This is only the beginning for the fixed target physics program, which is expected to deliver more results of interest to cosmic ray physics, and also to heavy ion physics. We are also in the process of developing further this program in the future by improving the target system." It should be noted that a thorough and systematic measurement of the antiproton cross- sections over a wide energy range is extremely important and through different process will shed more light on understanding some of the cosmic puzzles. LHCb could scan the beam energy from 0.9 to 7 TeV, offering results of the antiproton production cross- sections over a wide energy range. Moreover, the measurement is extended to lower energies by another CERN experiment, NA61 that recently provided precise measurements from pp collisions. The LHCb team also plans to extend the study to antiprotons produced by anti-hyperon decays, expected to account for 20-30% of the production. 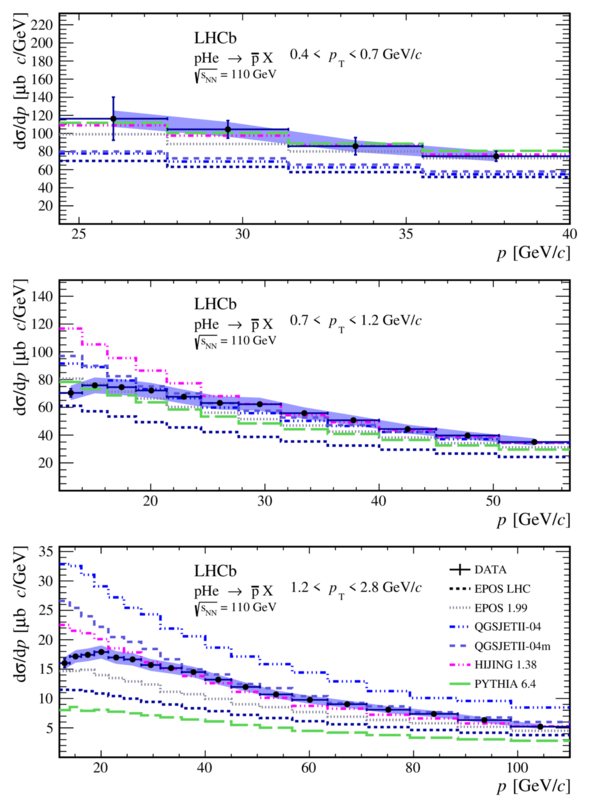 LHCb can cleanly select decays of anti-Λ baryons, and also measure inclusively detached antiprotons from both anti-Λ and anti-Σ+. “The LHCb Collaboration has been amazingly reactive to our requirements on cross- section data on helium target. They have arrived with the first data ever. Their measurement paves the road to more precise predictions, permitting us a better understanding of the origin of antimatter in our Galaxy and of possible contributions from cosmological relic particles” says Fiorenza Donato, professor of theoretical physics at Turin University and one of the main instigators of this kind of measurements. Accurate measurements of the cross sections would allow more information to be extracted from the now rather precise CR measurements and affect the way we interpret current evidences for primary antiprotons signaling exotic processes. Current results reflect the complementarity of CERN’s research programme, and will contribute to our understanding of the origin of cosmic rays; the mysterious messengers of our Universe.